The kids love these! ALL NEW CONTENT!! Everything you need to make your er ... including: a story, a control picture, picture parts for building the picture, control sheet containing answers to the mapping page that goes with the story, and a master copy of the worksheet. Great for age 4-8 and special needs. 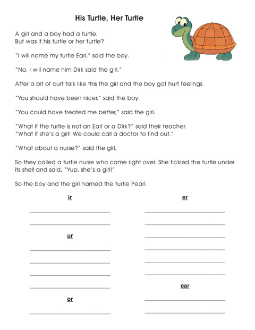 Set 2 includes all of the above for the sound er story, His Turtle, Her Turtle PLUS all 15 er words from the story in large format for one on one or group presentation. Nine pages in all plus the directions. Directions for constructing your pocket folder are included.